I have recently rekindled my love affair with small, mirrorless cameras. I can’t help myself, they’re irresistible. I have written some about it before, and I have a good deal more to write about it soon, but right now I’m still in the process of collecting data: photos, impressions, annoyances, joys. Consider this partly a preamble–even though this post is about a carrying solution, it was triggered by the need for said solution with a new camera. 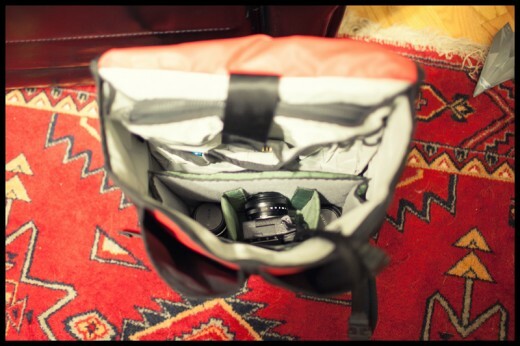 I’ll start with a little background–there is no perfect camera bag. In my short review of the Domke F-2 I sang that bags praises while tallying up all the other bags that I have accumulated over the years. To whit, I have at least seven camera bags, ranging from small to large, and serving different functions. When the Fuji X-E1 arrived last week and I started looking at even more camera bags, my wife rolled her eyes and said, “again?” To be sure, as I start downsizing my kit and shedding bulky DSLRs, I’ll be able to decrease the number of bags I have. Still, she got me thinking–might there be another, better way? Might I be able to use something I already had? Simultaneously, I have been thinking about and looking for ways to streamline my air-traveling experience and to pare things down to the minimum needed. My goal was to get everything down to two bags, both of which could be carried onto the plane without hassle. As those of you who travel frequently know, air travel requirements are often at odds to destination requirements–i.e., it’s all fine and good to wheel my camera gear around in the stalwart ThinkTank Airport International to get it from point A to point B, but then how do I carry some of that stuff when I go out to photograph landscapes, or walk the city, or whatever? You can’t very well roll your entire kit around shooting street in Brooklyn. Therefore, bags, clothes, and other items that can multi-task become vastly more valuable and useful when traveling. When I traveled to the West Coast in January, this thinking led me to the Domke Protective Wrap, a padded piece of material fitted with velcro that could be wrapped around a camera body or lens, which could then be stuffed into any manner of non-camera bag. It provided crucial to my packing on that trip, allowing me to carry an extra camera body in my backpack, as the camera bag I’d chosen was already full. It seems natural, then, to look to Domke once again for a solution, as its products have helped so much this year. Enter the Chrome Soma messenger bag and the Domke 3-compartment bag insert. The Soma is a big, supremely flexible and useful messenger bag, featuring a laptop compartment and lots of other useful compartments with stuff. It was very generously given to me by a friend as a result of this post, a gesture I will never forget. The Domke insert is a deep, padded box with two included velcro dividers. The sides are open on the bottom to allow you to add or remove padding as desired, and the inside walls are sewn continuously along the bottom so that no small items will fall out. The insert is probably not wide enough for a full-size DSLR, but I’d bet you could wedge one of the entry-level DSLRs in there with a lens or two. The great thing about most camera bags is that they are optimized for carrying and protecting cameras. Some work better than others, but most camera bags I’ve used have clever solutions to photographer-specific problems–well-sized pockets for widgets and well-placed straps, pads, and tethers for various accessories. They have deep pockets, they have shallow pockets, they have tiny pockets with velcro closures so you don’t lose your tiny SD cards. However, making a bag so camera-specific can also be a major drawback, especially when traveling. As I mentioned before, I very much value things that have maximum flexibility and potential for multi-tasking. I want a bag that can protect and transport my gear to my destination, and then comfortably be used to shoot out of, as well. This Domke insert allows me to do just that–since it just drops into the Soma, my messenger bag can pull double-duty as both a day bag and as a camera bag. Additionally–crucially–it has plenty of space for stuff other than my camera–my laptop, plane tickets, itinerary, phone chargers, snacks for the plane, clothes. You name it. It is useful as both a bag AND as a camera bag. 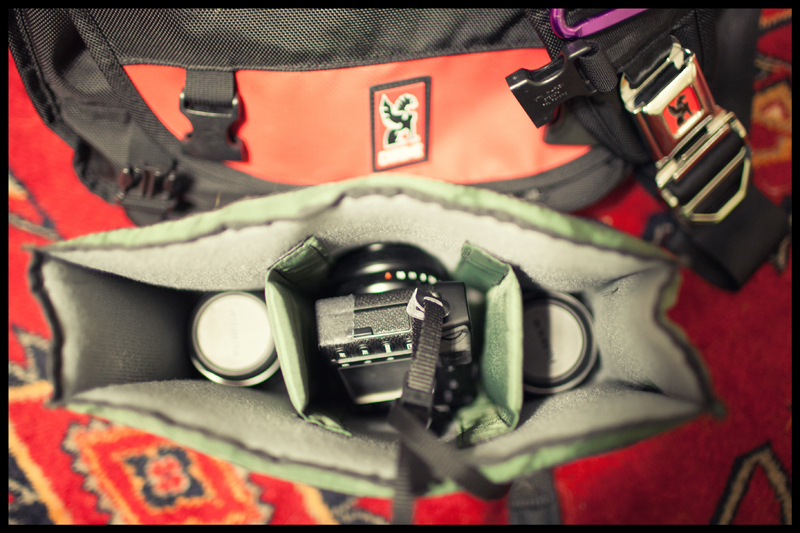 And if I’m not going to be shooting, I can always pull the insert out and use the Soma as a regular bag. If I need even more space for stuff, as I sometimes do, I can put the insert in my backpack instead. The value of the insert is that it takes useful, general-purpose bags that you already have and adds another dimension of utility as camera bags. It was F-Stop’s Internal Camera Units (ICUs) that initially got me thinking about alternative ways to carry my gear. Of course, this solution really only works with a smaller camera, and my move back to a mirrorless system is another subject for another day. Suffice to say, I have kept my eyes on the Fuji system since originally expressing my skepticism and disappointment about it over a year ago. Since that time, though, Fuji has been diligently improving the abilities of these cameras to the point where they again became a viable option. I am excited about moving forward in a different direction, and a big part of that is a more portable–but very capable–camera system. The takeaway from this blog, though, is that the marriage of a robust, well-thought-out messenger bag and a simple box of padded foam sometimes results in the most useful, most perfect camera bag you have. I’ve been using a Timbuk2 messenger bag with Domke insert for the same reasons. I find the bag light, strong, and waterproof. I had been using a canvas Domke bag but that is heavier. I converted to this so that I could travel like you, with two bags. I carry three or four cameras; two Leicas, Hasselblad SWC/M, and Rolleiflex, lots of 120 and 135 film, lens hoods, light meter, laptop, iPad, and notebook. It all fits in there. I use this same bag for work, when not photographing, and just carry my laptop. When I’m shooting I just take out my laptop and put my cameras in. 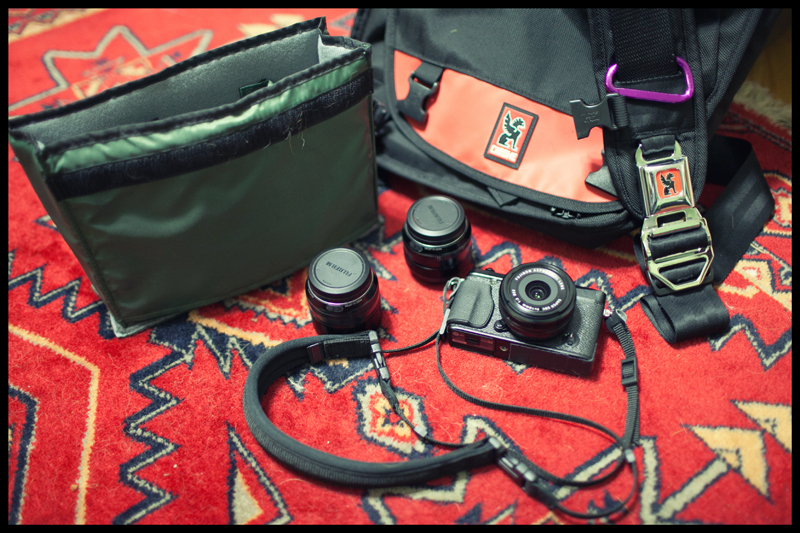 Really the best solution for traveling with two bags, carrying camera gear and work stuff… totally agree with you.